The final calculations are done and diploma received from Save the Children. Julie, who is the Global Director of Plastic Oceans wrote me on November 1 and thanked us: "Thank you so much for your support! We were so surprised to learn that you included Plastic Oceans in your annual call to arms auction. With the funds you have helped raise, we will be able to reach hundreds of thousands of school children to educate and engage in action to create real environmental change.. We would love to find a way to properly thank you and highlight you and your work..."
Important charity ending notice below! We are entering the final phase of the charity. All auctions end on 11:59:59 p.m on October 31st Central European Time (CET). The CET Timezone can be seen on this page. Don't expect to be able to post during the last minutes, there will be a lot of KVR members trying to do the same thing and you might encounter KVR not being responsive due to this. Bids with a timestamp later than October 31st are not valid - so do yourself a favour and post your highest bid hours in advance. Replies (bids!) that have the edited timestamp after the charity has ended is not valid either so make sure you reply (or bid) with the correct amount and text and don't change or edit anything after. After you have transferred the funds you must forward the receipt you get from PayPal to my email address luftrum@luftrum.com - this is very important. Not a screenshot or a picture of the receipt but the whole email. Payment are to be made within 48 hours of the end of the auctions. Winning bids not transferred in time will be offered to the 2nd highest bidder. The cost of this are the PayPal fees. When you have a non-profit with PayPal they still charge 2.2% + 0.30 USD per transaction so I am asking you to add an extra 3% on top of your winning bids to add up for the fees. This is not mandatory, but 3% is encouraged. You decide if you want to add it, but an extra 3% on top of a $100 winning bid is only $103 and hopefully you can afford that - considering the bargain you will be making. I will contact each company and send them the winner details (email and name) after you have transferred your winning bid total. Do not contact companies yourself claiming your products. Give me at least a few days to complete this - there's a lot of logistics to keep track of and in the meantime don't PM me asking if I have contacted company X and don't PM me as an extra gesture informing me that you have transferred the funds and send the receipt. I strive to contact the companies only once and that is when I have received all payments regarding that developer group - and that might mean a delay, if I receive the last payment for a company several days after auction end. I will keep you informed via this thread and let you know progress. After companies are contacted give them at least a week before you contact them or write me, since this is a pure goodwill from the developers, licenses and products are send out when they find available time in their schedule to respond. Patience is really the key word here. Beside Save the Children, I am adding another non-profit to receive the funds we raise which is Plastic Oceans Foundation simply because the environment concerns me too much. I have not had any prior contact with them and they have not approach me either, it's entirely my own decision. They don't even know they have been added to this fundraiser. How will the funds be split? Well, first the auction contributor decide between the two and if the contributor is okay with either, then the auction winner decides instead. So... this year we got two really great non-profit causes to raise for! Note to bidders: All software products on auction for charity are licensed as NFR (Not For Resale) meaning you cannot re-sell the software once you activate the license. I cannot speak for all companies on the list, but unless otherwise stated, it's NFR. You are also bidding on downloads only unless otherwise stated, no boxed version will be sent to your home address, no physical shipping will be made (with the exception of hardware), you are bidding on licenses alone. We got a 2nd hand market running too, managed by EnGee. Here you can donate your old and unused plugins to a good cause and bid on stuff too - grab a bargain! Donating: $1000 for Save the Children. Also donating 5 x Luftrum All Bundles + Lunaris ($627 value). Each bundle contains soundbanks for a variety of synths from Omnisphere 2 to U-He Diva, TAL U-No-LX, Grain, iZotope Iris 2, Prophet-6 and more. Also on auction is the English version of the charity diploma for Save The Children, it will pride your studio wall! The funds raised for the products below, will go to Planet Oceans Foundation. Donating: Donating 2 x Kompletely Omnispheric Bundles for Omnisphere 2 and 2 x All U-he soundset bundle. Funds raised to support Save the Children. Donating: Donating 5 x SynthMaster 1+2 bundles. Donating: Donating 3 x Signature Bundles and 2 x Producer Edition. Donating: Donating 1 x AIEP 3 Complete $499.99, 2 x AIEP 3 Select $399.99, 2 x Loom II. Donating: Donating 1 x Solina Redux $249.99, 2 x Stratum $199.99, 1 x Essential Keyboard Collection $99.99. Donating: Donating 5 x Studio 7 $199.99. Donating: Donating 5 x TimeWARP2600 ($99.99 each). Donating: Donating 1 x Entire Touch Loops Sound Collection $1000 and 4 x Ethereal Instruments - Ableton Racks $40. Donating: 326x272 banner advertisement at rekkerd.org. 100.000 impressions. Great for developers to advertise products or sales, or perhaps you would like to advertise your music. The banner campaign runs from your chosen start date, which should be within a year from when the auction ends. At the current advertising CPM price you're bidding on a $250 value campaign here. Note that this auction will only allow advertisements relating to rekkerd.org, so music production software, sounds, music, etc. are all good. Dating services, online casinos etc. are not. Donating: Donating one each of the following bundle packs: ModeAudio Downtempo Bundle - 1.91GB of audio (£42), ModeAudio Alt Drums Bundle 2 - 1,586 samples (£38), ModeAudio Synthwave Bundle - 1.94GB of audio (£45), ModeAudio Analog Drums Bundle - 1,588 samples (£40) and ModeAudio Ambient Bundle 2 - 2.5GB of audio (£40). Donating: Are happy to take part again! This year they will contribute: 1 x Komplete 12 Ultimate Collector's Edition - 1599 EUR. 1 x Komplete 12 Ultimate - 1199 EUR. 1 x Komplete 12 - 599 EUR. 1 x Collection of 5 Expansions that the winner can choose - 245 EUR. 1 x Thrill - 299 EUR. As also stated on top of this bidding list, these are NFR (Not For Resale) licenses, meaning these can’t be sold or transferred to a different user. Donating: Donating the usual bundles again this year 1 x All Synths bundle with Zebra2, Diva, Repro-1/5, ACE, Bazille and Hive (780 EUR value) and 1 x All Effects bundle with Colour Copy, Satin, Presswerk, Uhbik, Filterscape and MFM2 (615 EUR value). Donating: Donating store credits in the form of coupon codes, 2 x coupons for Planet Oceans Foundation and 2 x coupons for Save the Children. Each coupon is worth €200. The coupons can be used once for an instant €200 price reduction on any order and will be valid until the end of next year (Dec 31st, 2019). Donating: Acoustica Premium Edition 7.x ($199 USD), Equalize 2.x ($99 USD), DeVerberate 2.x ($99 USD), Verberate 1.x ($99 USD) and DeFilter 1.x ($99 USD) giving the auction winners the option to choose which of the two causes to support. Donating: Donating 1 copy of 1 x DyVision Reverb Remover, 1 x DyVision Video Tape Emulator, 1 x DyVision DyScratch. Donating: Donating 1 x Anomaly Vol. 1 with all presets, 1 x Dreamlands with all presets, 1 x Incantations with all presets and 1 x Anomaly Dark Impulses complete (all volumes plus bonus volume). Donating: Donating 3 x VPS Avenger full versions. Donating: 1 x EARevolve, 1 x EAReverb 2, 1 x EARebound, 1 x TransReckon. Donating: 1 x All NRS Soundware (soundbanks mostly for Reason, Rack Extensions and impulse responses, 47 products - $1056 USD), 1 x 2 Experimental impulse response bundles for any convolution engine/reverb in WAV+ReFill format ($150 USD), 1 x DX7 / Volca FM - Patchology sysex patches for DX7 compatible synths ($28 USD). Donating: Voxengo are donating 2 x Voxengo Premium Memberships 3 x Voxengo Premium Memberships. Donating: Donating a bundle of all 11 commercial preset banks. See the titles in the link above. Donating: Would like to donate 3 x Effect Bundles (https://www.audiothing.net/bundles/effects-bundle/) and 2 x Drum Machine Bundles (https://www.audiothing.net/bundles/drum ... es-bundle/). Also, no transfer fees for the second hand market. Donating: 3 custom bundle. All of them containing 3 free choice from all of the soundsets ($105 value). Donating: Donating 1 x Aether Pack, 1 x B2 Pack, 1 x Kaleidoscope Pack and 1 x Breeze Pack. *Falcon Bundle containing three sound libraries for Falcon - reg. price € 172.50. *Falcon Singles Bundle containing all 11 single libraries for Falcon - reg. price € 220. *HALion Bundle (at the bottom of the page) - containing three libraries for HALion - reg. price € 135. *Dmitry Sches Bundle containing two soundsets for Diversion and one for Thorn - reg. price € 88. *Serum Bundle (in the far right tab) containing all three patchpool soundsets for XFer Serum - reg. price € 73. Donating: Are happy to offer a Total Bundle as last year! Donating: Donating 3 x D16 Total Bundle licenses for the auction. Donating: With a great pleasure they offer the following 2 x Thorn + Expansions, 2 x Tantra + Expansions, 1 x Diversion. Donating: More than happy to contribute the same layout as last year. 1 x Addictive Drums 2 Custom XL, 1 x Addictive Drums 2 Custom, 1 x Additive Trigger, 1 x Addictive Keys Trio Bundle, 1 x DS-10 Drum Shaper with RC-20 Retro Color. Donating: Tronsonic are very happy to offer 2 complete Tronsonic bundles (over £200 in value) - containing various synths and unusual tape sampled instruments for Kontakt. Donating: Happy to chip in 5 commercial REAPER licenses again. Donating: Donating 3 x Bitwig Studio licenses (download). Donating: They'll be happy to pledge 5 x Radical Bundle 3 Licenses for this important cause. Donating: They'd like to donate a Impact LX25+ DAW Controller and a Pacer MIDI Foot Controller for the charity auction. Donating: Loopmasters are donating a bundle of choice from http://bit.ly/1T6D8vy Plugin Boutique donating a Plugin Boutique Bundle http://bit.ly/2ylsC0m. Also offering the Scaler plugin from Plugin Boutique. Donating: Happy to donate a copy of each bundle: Omnisphere, Zebra, Diva, Massive and a Complete Bundle. Funds raised to support Save the Children. Donating: Would like to donate 5 x Omnisphere 2 Bundles - containing 6 Omnisphere libraries Traveller, Cloud Atlas, Journeys, Empty Fields - F2, Pagan III and Time - bundle is priced at €198.50. 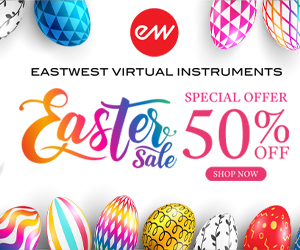 Donating: Donating 1 x MMasteringFXBundle - €649 (+/- $782), 1 x MMixingFXBundle - €599 (+/- $722), 1 x MCreativeFXBundle - €499 (+/- $601) and 1 x MPowerSynth - €199 (+/- $240). Funds raised to support both causes. MMastering and MCreative bundles to the children and MMixing bundle and MPowerSynth to the environment. Donating: They'd love to help again, donating the following 5 products: 1 x Native Elite bundle, 2 x Native Dynamic EQ's, 2 x VoxDoublers. 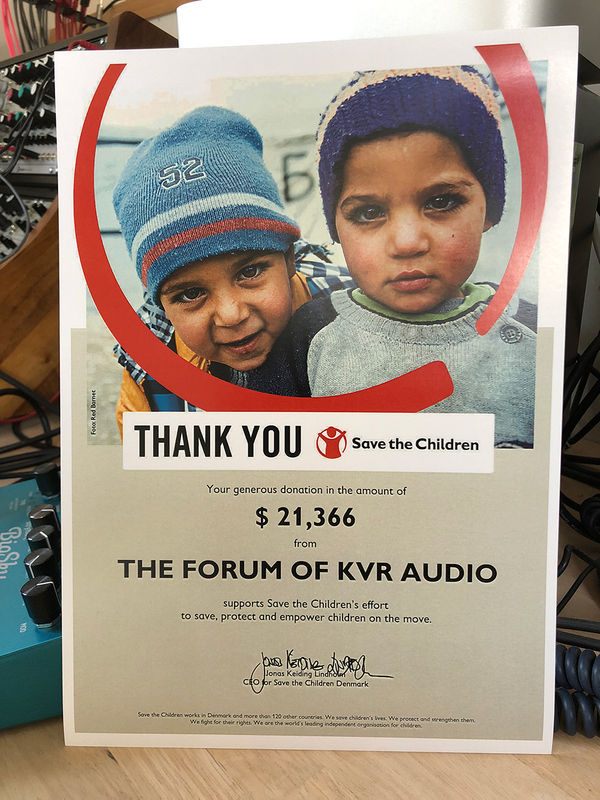 Donating: Auburn Sounds is willing to give one "All Plugins Bundle" for the KVR Charity 2018. Donating: 2 x Quadra Libraries and 2 x Polycom (Polymoog 203a library which includes ZOM ZOM 280a library). Donating: 1 x Discovery Pro license, 1 x Vertigo license, 1 x Bliss license, 1 x Corona license, 1 x Discovery license. Donating: Adding 3 x DDMF Full Bundles ($199 each) to the list. Donating: Cableguys Bundle value €169 / $179, ShaperBox Bundle value €94 / $99, TimeShaper value €39 / $44 (includes free license of HalfTime), VolumeShaper 5 value €29 / $34, HalfTime value €10 / $12. Donating: Would like to donate a Loomer Complete Bundle, comprising Aspect, Manifold, Resound, Sequent, Shift v2, and String. Donating: Are happy to participate again and would like to donate two Melodyne 4 studio licenses (each worth € 699). Donating: Would like to donate one of each of the Klein Bottle pedals each worth $359. You can learn more about the Klein Bottle and what it does at http://www.vfecustom.com/klein-bottle (thanks to vurt for contacting VFE Pedals). Donating: Donating 3 x Ohmboyz Infinity delay. Donating: As always they are happy to participate! Would like to supply 5 licenses of DUNE 2 (NFR), list price $169. Important note to DUNE 2 bidders: Since DUNE 3 is near, after the auction you will have the option to get either DUNE 2 or DUNE 3, it will be your choice. So bid high, you may get more than expected. Donating: Happy to donate again: 2 x bundles of any 3 packs from the Goldbaby catalogue? Donating: Donating Celtic Era, Ancient Era, Kwaya, Accordions and Cantus. Donating: PSP wants to donate: 1 x TotalPack ($1499 value), 1 x EffectPack ($699 value) and 1 x ProcessorPack ($1199 value). Donating: Would be honored to contribute with SampleSumo by donating 3 x NFR licenses of SaltyGrain, their granular audio effect plugin. Donating: Contributing with a Complete GuDa Audio pack consisting of KickR, DrumR, EuterpeXL and EnvelopR. Donating: Donating 3 x One LVC-Audio Plugin or T-Chain Module of your choice ($19.95 - $64.95 value) and 2 x Three LVC-Audio Plugins or T-Chain Modules of your choice ($59.85 - $194.85 value). Donating: Will gladly participate again, with 2 x Pianoteq Stage (worth $129 each). Donating: Willing to donate 5 x SuperWave Ultimate Bundles. Donating: Donating 1 x All Bundle to the charity (All VST/AU bundle, not the Max for Live stuff). Donating: Donating 5 x 100% coupons which can be used on any of the SPC plugins. Donating: Donating 3 x Omnisphere Bundles (67 EUR each). Donating: Inear Display all plugins bundle (Ephemere, Amalgame, Litote, Incipit, Cruelle) plus an Ephemere and Amalgame bundle. Donating: They'd love to take part and would like to donate 5 x Collection Bundles worth EUR 120 each. Donating: Want to donate 3 x a bundle of their commercial available Spire sound banks Dawn of Dreams and Drumspiration. The bidders can pick the charity. Donating: Wants to participate in the Call to Arms: Charity 2018 with 3 x their plugin "faTimeAlign". Donating: Donating hardware effects and Eurorack modules: 1 x Thyme, 1 x SoftPop, 1 x GrandPa ALU, 1 x Cinnamon ALU, 1 x Knit Rider ALU and 1x Little Nerd ALU. Donating: Donating one Integral Bundle licence. This comprises all 6 pro series instruments as well as our 35 sound packs. The retail value is $899. Donating: 1 x Elevate Mastering Bundle (MSRSP $199) Includes 4 plug-ins: Elevate, EQuivocate, Punctuate and Saturate, 1 x Ultra Essentials Bundle (MSRP $299) Includes UltraChannel, UltraReverb and UltraTap and finally Anthology XI Bundle (MSRP $1799) Comes with 23 plug-ins. Donating: Offering 2 x Crazy8 sequencers for the charity, which they think will be enjoyed as they recently released a new major OS update that brings many improvements to the table. Donating: Would like to provide 3 x Nexus licenses ($249.00 USD value each) for the charity. Donating: Happy to donate one instrument engine + an expansion pack for that engine. Donating: Offering licenses for each of their main player libraries: Emotional Piano, Requiem Light, Elysium Harp, Rhythmic Odyssey, Voices Of Rapture, Voices Of Gaia, Voices Of Rage, Motor Rhythms, Olympus Choir Elements, Apocalypse Percussion Elements, Mercury Boys Choir Elements plus a Halloween Bundle (Sick 1-6, Theremin+, Shudder and Aztec Death Whistle). The main libraries will be bundled in single and dual packs. Would like the donations go 50/50 to children and the environment. Donating: Would like to donate 3 custom bundles, each containing 5 single sound sets of choice (subscriptions excluded). Donating: Providing £200 coupon code to spent on any packs from Prime Loops, Future Koncept, XXL Audio or Total Samples. Donating: Offering a copy three copies of Frosting which is $29.90 worth each. The detail of Frosting is here: https://ju-x.com/frosting.html. 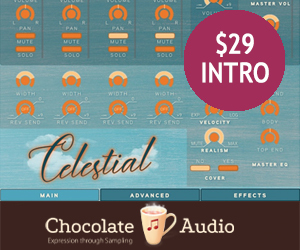 Donating: Are happy to put forward 5 of their Waveform 9 Ultimate Bundles. Donating: 3 x Heatup2 Licenses and, 1 x Sektor Hybrid Wavetable Synthesizer Licenses and 1 x Heatup2 Ultimate Bundle License. Donating: Wish to donate 3 x Effects Plugin Bundle for the charity. Donating: 1 x SSL package including the Townhouse Compressor (SSL 4000E and SSL 4000G with the Townhouse Compressor), 1 x Metric AB ($179), 1 x Unflitered Audio Zip ($149) and 1 x BX Masterdesk ($299). Donating: Donating 4 x ZAP II bundles (each worth $1499). Funds raised to support plasticoceans.org. Donating: Donating one pack containing The Works + Mystery Plugin - Kilohearts' biggest plugin yet, to be released in 2019. Donating: Happy to support the charity project, ready to donate 3 x Spire + Sound Bundle licenses (each worth $259). Donating: Would be happy to participate in the KVR-Charity 2018 event - donating their complete set of 3 Eurorack modules: 1 x DSM01 Curtis Filter Module (MAP $179 USD), 1 x DSM02 Character Module (MAP $259 USD) and 1 x DSM03 Feedback Module (MAP $275 USD). Donating: Three bundles which include all of Touch The Universe Productions soundsets. Here is a link to all the soundsets. Full Value around $400. Donating: They'd be happy to once again participate. Happy to offer up an RX 7 Standard Licence ($299) and a license for the O8N2 Bundle ($699). Donating: Delighted to donate 3 copies of Circle2 ($129 each) towards the charity. Donating: 1 x 4 Trap Sample Packs (£89.92), 1 x 4 Techno Sample Packs (£114.92), Bundle for U-he Synths (£79.92), Serum and Massive Bundle (£74.90), Native Instruments Kontakt Bundle (£84.92). Donating: 1 x Cubase Pro and 1 x Groove Agent for this cause. Donating: Be happy to donate the following to the auction: FXpansion's BFD3 ($349 value), FXpansion's Geist2 ($199 value), FXpansion's Strobe2 ($179 value), FXpansion's Cypher2 ($199 value), ROLI's Equator ($179 value). Donating: 1 x ANA 2 ($98) and 1 x KICK 2 ($49.95) plus 1 x Annual Subscription. Donating: Offering two bundles with all TAL products. Each TAL coupon can be used to get all products, the user just have to add them all to the cart before using the coupon. Products included: TAL-U-NO-LX, TAL-BassLine-101, TAL-Sampler, TAL-Mod, TAL-DAC and TAL-Dub-X. Donating: Contributing with SFX libraries to this year's edition. Donating: 1 x Vehicles and Aircraft bundle (WW2 Aircraft, Cargo Trucks, Comrade Tractor and Junk Cars, $405 value), 1 x Ambience bundle (African Wild West, Human Africa, Wetland Atmosphere and Eerie Forest, $390 value) and 1 x Sound Design bundle (Elements: Gears, Elements: Ice, Elements: Zippers and Metal Atmosphere, $240 value). Donating: Soundly will gladly participate in the charity, with three promo codes that each give the winner one free year of Soundly Pro. Donating: They'd like to contribute this year as well. Donating 2 x Synplant, 2 x Microtonic, 1 x Effects Bundle (Permut8 + Echobode + Bitspeek). Donating: Donating a bundle 3 x bundles consisting of the 3 plug-ins (smart:EQ 2, proximity:EQ+ and entropy:EQ+). The regular bundle price is €289. Donating: Would like to donate 3 licenses of Youlean Loudness Meter 2 PRO ($47 each). 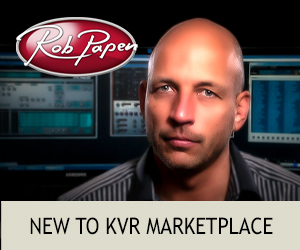 Donating: Would be happy to contribute by donating: 1 x Falcon license (value $349), 1 x Vintage Vault 2 license (value $599), 1 x World Suite license (value $299), 1 x Drum Designer license (value $149) and finally 1 x all-effect package including Sparkverb, Plate, Relayer, Rotary and Thorus (value $545). Donating: Welcome the opportunity to donate two Voltage Modular + Electro Drums Bundle [Download] licenses ($200 USD value each). 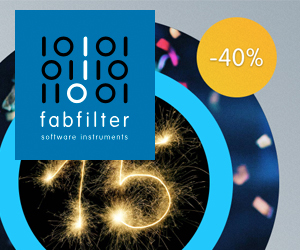 Donating: 1 x Preamps Bundle and 1 x Filters Bundle and 3 x individual software free of choice (between 100 and 200 euros). Donating: Glad to donate one of each plugin again: Aalto (retail price $99), Kaivo ($129) and Virta ($89). Donating: Offering 1 license each of FORZO ($549), NOVO ($549), and PUNISH ($199). Donating: Adding in 2 x Coincidental bundles (Prism Sticks for Chromaphone, After Hours for Lounge Lizard, Textur for ACE) - value approx $40. Donating: Donating a license of Omnisphere 2.5! Donating: Donating 3 licenses for "XA Instruments Bundle" (value: 149 Euro each). Donating: Donating a Scarlett 6i6 to the highest bidder. Last edited by Luftrum on Wed Nov 28, 2018 7:11 am, edited 100 times in total. Thanks for organizing again this year Luftrum, let's get this charity started! Last edited by Biome_Digital on Tue Oct 23, 2018 6:32 am, edited 1 time in total. Thanks for your hard work, Luftrum. Much appreciated! Always an event to look forward to!